The Art Of... A-Frame Building | The Art Of | Kids VT - small people, big ideas! 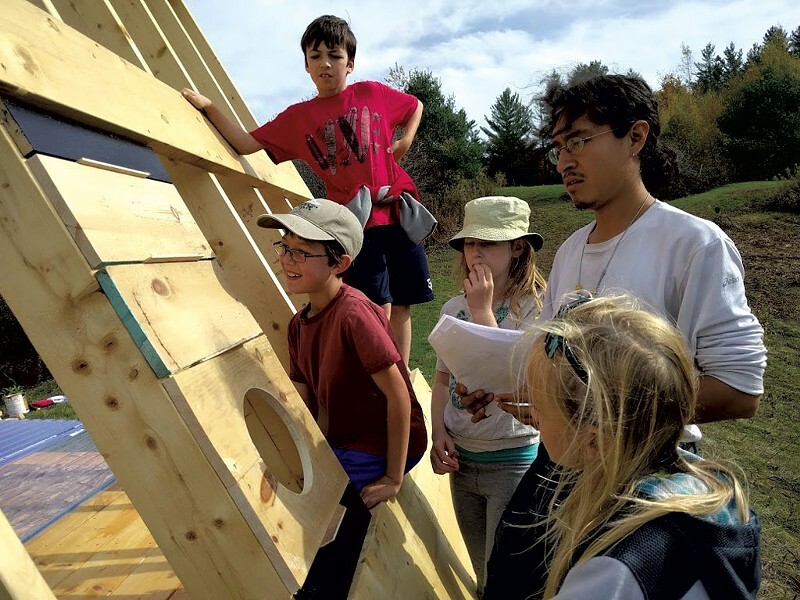 On a warm October day, six kids tromped up Pancake Hill at Moretown's Pony Farm toward a half-built A-frame structure they'd worked on over the last month. The 7- to 12-year-olds gathered in a circle, discussing their accomplishments and what they still needed to do. It was the fifth session of Sculpture School, a six-week after-school program run by Eddie Merma, a sculptor originally from Chicago. Merma began teaching building classes for kids in the Mad River Valley two years ago. His offerings range from utilitarian classes on building yurts, tiny houses and A-frames to wildly creative lessons in making original carnival games and vehicles. All of them are guided by the same philosophy — he seeks to "generate curiosity about the way things work," help kids develop "a creative eye," and to empower them to make, and learn from, their mistakes. "With basic tools and some basic math you can create something life-sized, something that you can inhabit ... something permanent," he explained while his students painted panels that they'd later attach to the A-frame structure using electric drills. Merma makes sure that at every possible opportunity his young students contribute to design decisions. "Eddie has given us all these different options," 10-year-old Jasper Mayone of Fayston explained enthusiastically. Merma elaborated, pointing to the unique geometric designs on the side of the A-frame: "There are things we need to accomplish for structural integrity, but, if we want to cut a big circle right here to make a shape, we can weave all these things in," he said. The kids weighed in on where to put wood siding panels and polycarbonate roof panels. They decided to create a design that generates interesting shadows inside the structure. Jasper thinks the outdoor class provides an important alternative to his school learning. "Working up here calms us down," he said seriously, gesturing to the wide expanse of the valley. "In school we don't have that much choice and we're inside a classroom working." Merma normally teaches at Knoll Farm in Waitsfield, but he's excited to collaborate with Cory and Chris Stephenson, the new owners of Pony Farm and enthusiastic Sculpture School parents. Cory, a longtime environmental educator, is hoping to turn Pony Farm into a place-based education center for kids and adults, and to fill existing gaps in the Mad River Valley's food system. She planted Christmas trees this year and intends to plant apple trees soon. She reached out to Merma to jump-start the farm's educational programming. His classes, she believes, provide kids with a sense of agency and competence sorely lacking in a risk-averse educational climate. In addition to offering a learning experience, the brightly colored A-frame will be a multipurpose space for future educational programs. "It's an outdoor classroom that kids built," Jasper explained enthusiastically from his perch halfway up the structure. "It comes full circle."